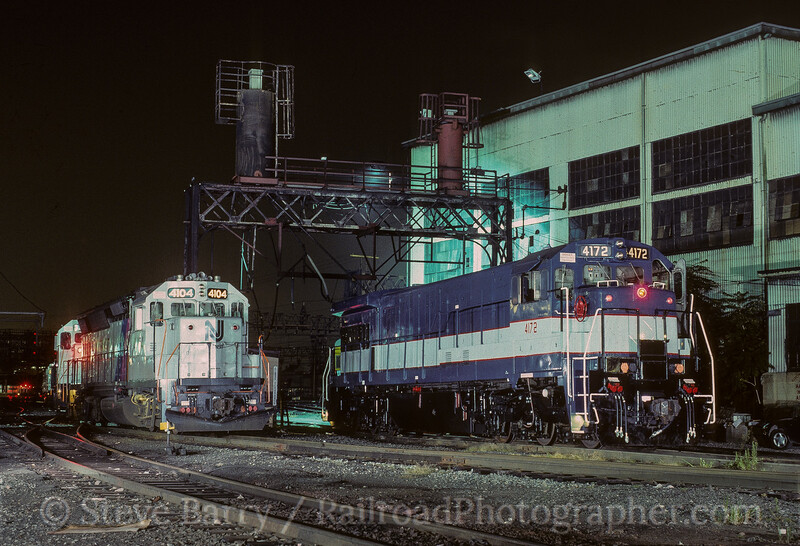 On New Jersey's commuter roster was a unique locomotive model -- the U34CH diesel built by General Electric in 1970. The 32 units were purchased by New Jersey's Department of Transportation for use on lines operated by Erie Lackawanna. 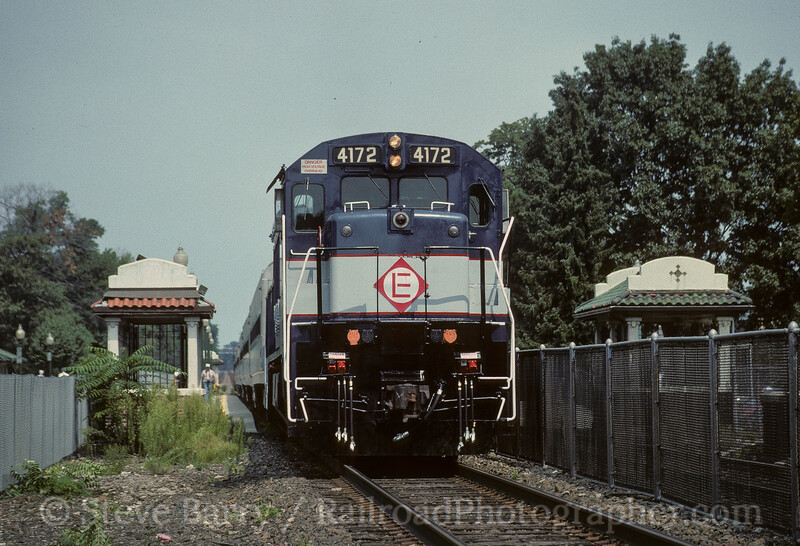 The EL was merged into Conrail in 1976, and Conrail spun commuter operations off to New Jersey Transit in 1983. By the early 1990s, the units were getting old and ready for retirement. 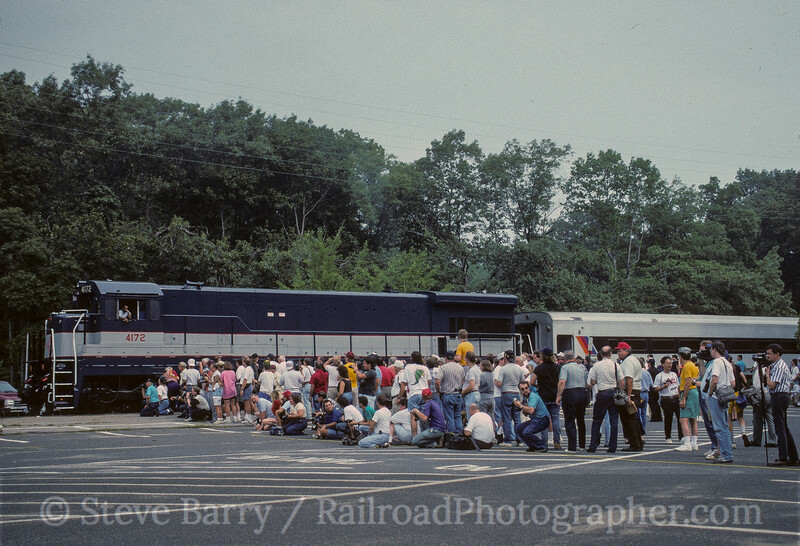 To send them off properly, NJ Transit teamed up with the United Railroad Historical Society of New Jersey for an excursion covering over 180 miles on August 27, 1994. After departing Hoboken Terminal, the special train headed to Netcong on the Boonton Line. On the west end was U34CH No. 4172 in the traditional blue and silver paint scheme most of the locomotives wore during their service lives; on the east end was U34CH No. 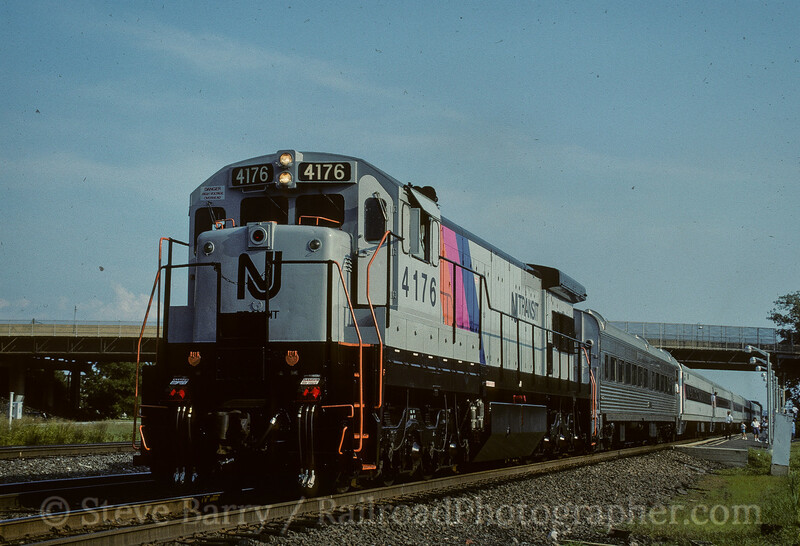 4176 in NJT's silver "disco" scheme, one of seven units to get that treatment. The first photo stop was made at Mountain Lakes (above) featuring the 4176. The photo line watched the train pull by with 4172 on the west end (below). 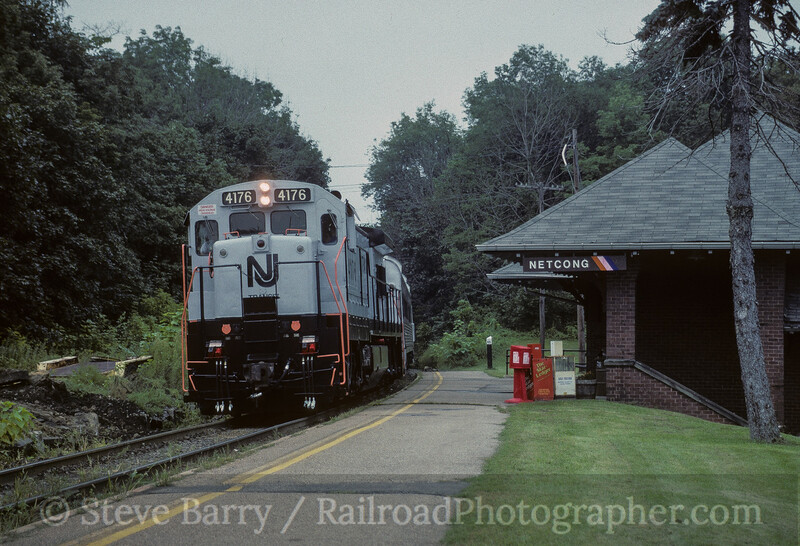 The next stop was at the end of the Boonton Line at Netcong (which is actually west of Boonton). 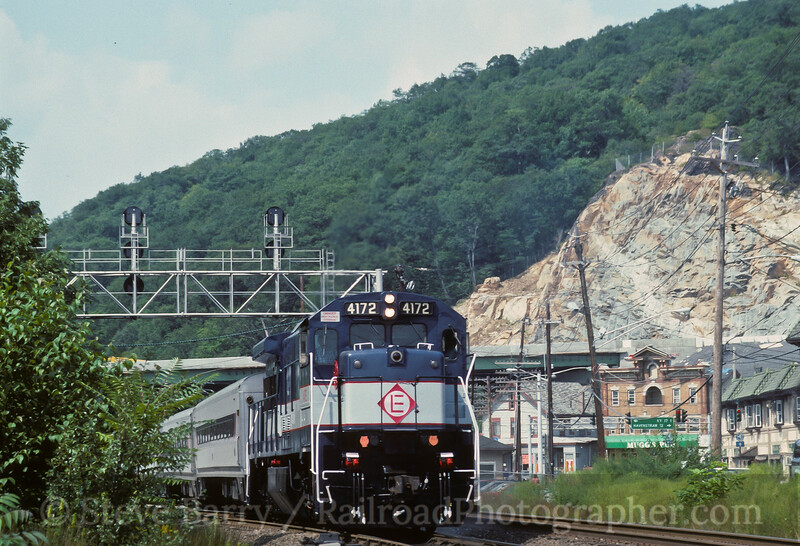 The 4176 was once again the featured power for the shot. From here the train reversed back almost to Hoboken to West End, where the train swung north on the Main Line towards Suffern, New York. A photo and lunch stop was made at Ridgewood with No. 4172 looking good pointing south into the sun. 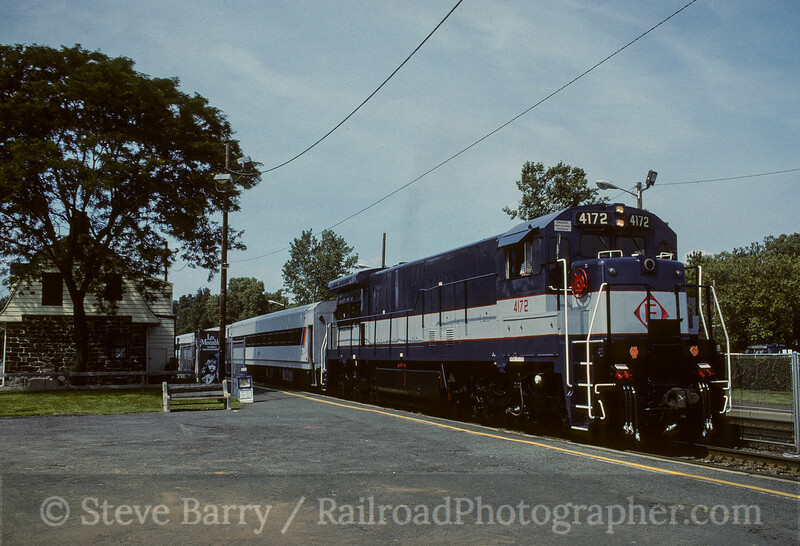 The U34CHs lost their Erie Lackawanna nose herald after going to Conrail, but Frank Etzel of the URHS added a temporary EL herald to the front of 4172 for the day. After lunch the train continued north to the end of the Main Line at Suffern (NJ Transit trains continue past this point to Port Jervis, N.Y., under contract with Metro North). Another photo stop was made at Suffern as the train prepared to return south. 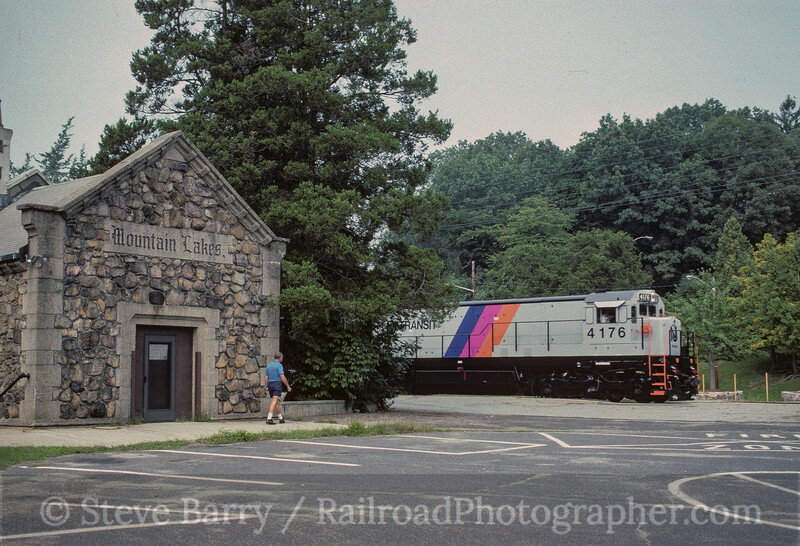 Reversing back south, the train went to Rutherford on the Bergen County Line, with another photo stop at the Radburn station, once again featuring 4172. At Rutherford, the train headed outbound again, this time on the Pascack Valley Line to Spring Valley, N.Y. The train then used the Pascack Valley Line and Main Line to ultimately return to Hoboken Terminal. 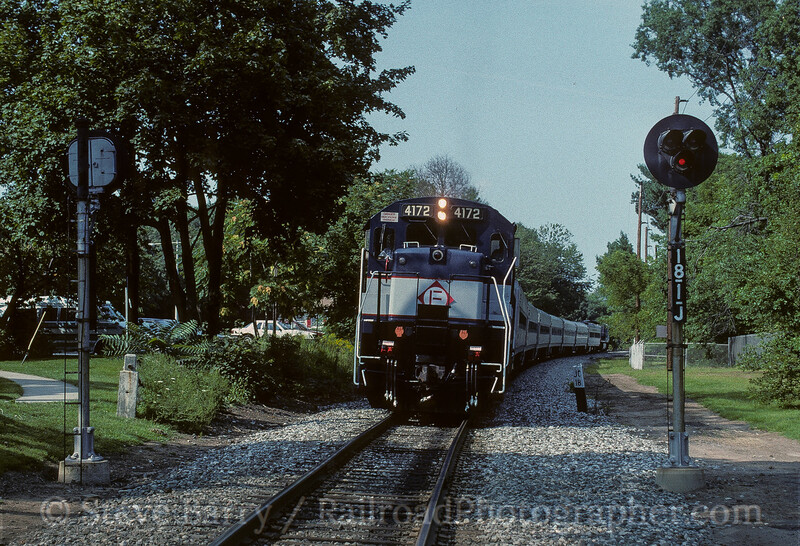 A photo stop was made on the Pascack Valley Line at Oradell, N.J. The final photo stop was at Harmon Cove on the way back into Hoboken. The trip was advertised to return at 6:30 p.m., but it rolled into Hoboken at 5:50, a full 40 minutes early! After dinner a few friends and I decided to do a "what the heck..." and wandered to Hoboken Terminal to ask if we could wander into the yard for some night shots of the U34CHs. Much to our surprise, they said "yes." We started with the 4172. We next turned our attention to the 4176, with the 4172 in the background. 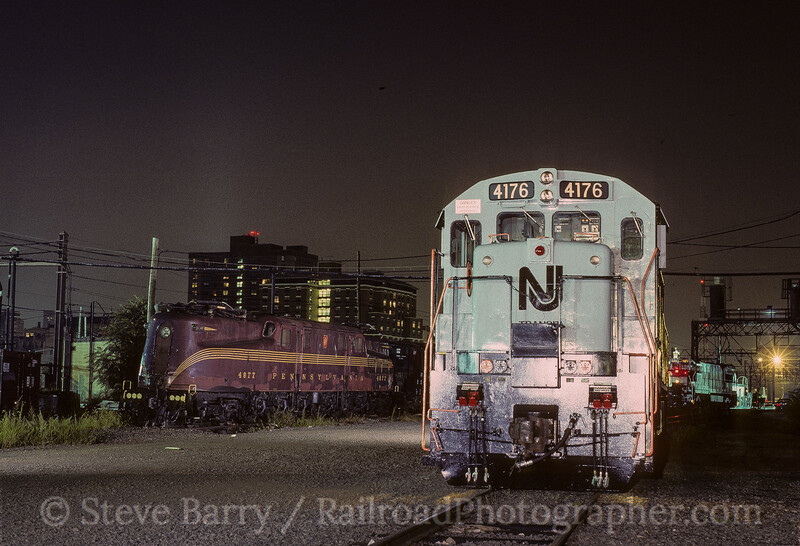 Our night finished up with the 4172 next to another veteran unit -- former Pennsylvania Railroad GG1 No. 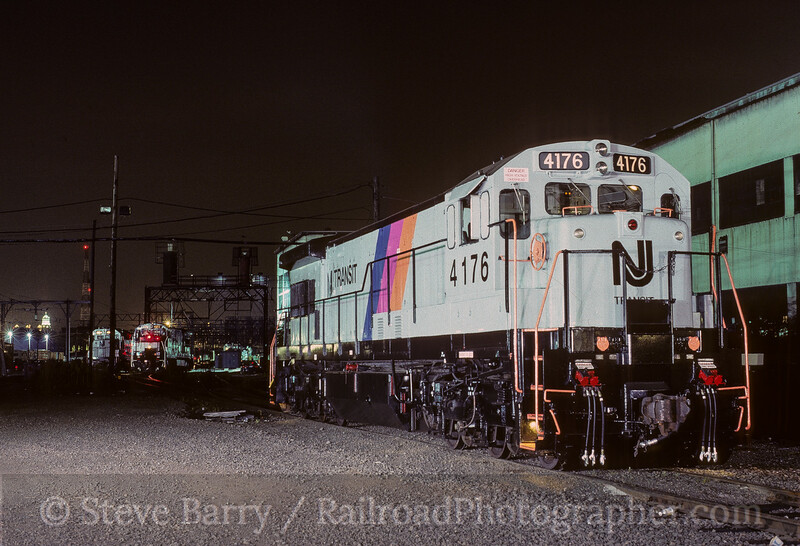 4877, which finished its career with NJ Transit and was being held at Hoboken for preservation by the United Railroad Historical Society. The U34CH locomotives would actually hang on in regular service for a few more months before being retired. Some saw later service for SEPTA in Philadelphia, while some were sold to Mexico, and others were scrapped. Only No. 4172, which ran on this trip, survives in the United States. It is now in the care of the United Railroad Historical Society, which is returning it to operating condition with its original number, Erie Lackawanna No. 3372.